In this photo provided by Hadoram Shirihai and the Royal Society for the Protection of Birds, a Beck's petrel was seen in the summer of 2007 in the Bismarck Archipelago, Papua New Guinea. The pale-bellied bird species, last seen in the 1920s, was long thought to be extinct. LONDON — A pale-bellied bird species last seen in the 1920s and long thought to be extinct has been rediscovered near Papua New Guinea. The Beck's petrel was photographed last summer by an Israeli ornithologist in the Bismarck Archipelago, a group of islands northeast of Papua New Guinea. Hadoram Shirihai, who led an expedition to find the seabird, returned with photographs of more than 30 of the birds and a freshly dead specimen found at sea — evidence that has so far convinced several experts. Shirihai's photographs and his report were published in "The Bulletin of the British Ornithologists' Club" on Friday. Britain's Royal Society for the Protection of Birds, and BirdLife International — a Cambridge conservation group — both said their committees of experts had reviewed Shirihai's evidence and agreed he had found Beck's petrel. "I don't think there's much doubt about it," said BirdLife International spokesman Nick Askew. The pictures are the first hard evidence of the Beck's petrel's existence since unconfirmed sightings of the bird were reported in Australia two years ago. Beck's petrels are seabirds related to albatrosses and shearwaters. They are dark brown with pale bellies and tube-like noses. Upon first glance they look similar to the Tahitian petrel, one of 66 petrel species, but Beck's are smaller and have narrower wings than the Tahitian variety. 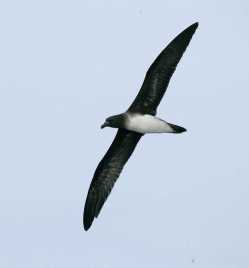 The last known specimen of the Beck's petrel before its rediscovery was collected in 1929 and the species is currently categorized as critically endangered by BirdLife International. Shirihai compared a dead petrel that he brought back with the data collected in the late 1920s by Rollo Beck — an American ornithologist after whom the bird is named — to verify that his was a genuine Beck's petrel. Shirihai has previously helped discover several new species in Europe, the Middle East and North Africa, the Royal Society for the Protection of Birds said. He is one of the very few people to have visited almost every sub-Antarctic island and the breeding grounds of all forms of albatrosses, the society said. Similar discoveries have touched off controversy in the past. In 2004, ornithologists in the United States took grainy videos of what they felt was an ivory-billed woodpecker, a magnificent bird thought extinct for decades. After the 2005 announcement, other experts said the sighting in an Arkansas swamp seemed to be a more common woodpecker. Three years later the debate still goes on.